Protesters block traffic on the Dan Ryan Expressway on July 7, 2016, in response to the police shootings of Alton Sterling in Baton Rouge, La., and Philando Castile in St. Anthony, Minn. 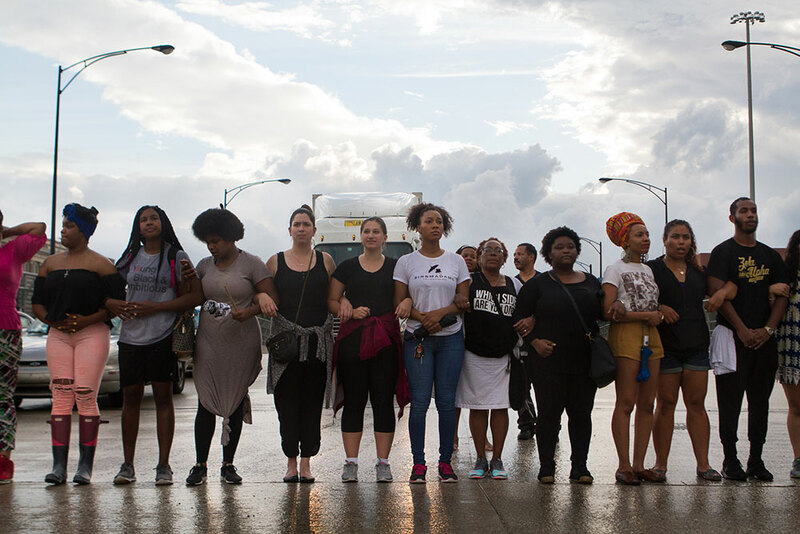 Historian Barbara Ransby and organizer Charlene Carruthers are co-teaching a course on Black Lives Matter this summer at the University of Illinois at Chicago. The course, which looks at the history of black organizing and protest, with a focus on police-community relations, comes as youth-led campaigns against police shootings of African-Americans are sweeping the nation. Ransby, director of the UIC Social Justice Initiative and a professor of history, African-American studies and gender and women’s studies at the university, is the author of Ella Baker and the Black Freedom Movement. Carruthers is the national director of the Black Youth Project 100, a membership-based activist organization. The Chicago Reporter interviewed Ransby and Carruthers about their course, what they hope it will achieve and how today’s activists are building on the work of past movements for freedom, justice and equality. Can you tell me about the curriculum of your course, who your students are, and what you hope that by the end of the semester they’ve gotten out of this course? 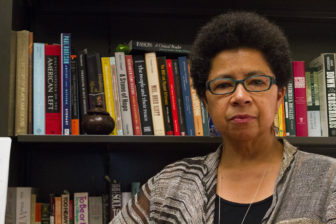 Longtime activist Barbara Ransby is a professor of African American Studies, Gender and Women’s Studies, and History at the University of Illinois at Chicago. BR: It’s a small course and our students reflect the city of Chicago. We have overwhelmingly African-American students, we have a Latino student, some of them are activists already, most of them are not. They’re curious, they’re eager to learn and talk about this movement that they see emerging around them. We have two texts that we’re using, one is called Policing the Planet, which looks at global policing patterns and opposition to police violence. The other one is by Keeanga Taylor, who used to live in Chicago and who is now a professor, a historian, at Princeton, called From #BlackLivesMatter to Black Liberation. Those are our anchoring texts, but we also look at primary documents, we have a lot of interactive discussions. What I hope that they get from the course, one, is to find their own voices. What do you think about this moment that you’re experiencing? To bring critical thinking skills to analyzing and assessing what’s going on. And also to connect it to history. No movement drops out of the sky, nothing just explodes on the scene without its own history and roots. Sometimes people participating in it don’t even fully appreciate all of those historical connections. CC: Students are asking critical questions of themselves and other people and just thinking about things in a different way. That, to me, is what any college course should do. It should promote critical thinking and if we do really well, for the folks who aren’t involved in activism currently, they will be involved in activism, and specifically in activism that holds values and lines around anti-police work, prison abolition work, feminist work. I’m going to change gears a little bit and talk about what we’ve seen in recent days here in Chicago, in Baton Rouge and in Minnesota where mass demonstrations have taken over highways and stopped traffic. I’m curious how this strategy connects with the large-scale civil rights protests of the 1960s. And why highways? BR: In terms of parallels to historical movements, it’s a little bit different. Certainly massive civil rights demonstrations in the past have taken over streets, taken over thoroughfares. But I think there’s a strategic kind of pointedness about some of the highway takeovers today. One is that they have been demarcations between white and black communities, they have been lines of segregation in cities when those cities were reconfigured. And they also are arteries of commerce. The message is that protesters are disrupting business as usual, and I think that’s a very powerful statement. It disrupts the material flow of commerce, but it also says to people that those protesters are very determined and prepared to take certain kind of risks in the tactics that they use. CC: It’s indicative of the dire circumstances our folks are facing, not just in this moment but historically. We are students of movements before us and while everyone doesn’t necessarily have the opportunity to study Black Freedom movements throughout their education, folks are aware that movement work has happened before us. As the state becomes bigger, more entrenched in our everyday lives and repressive, for better or for worse, our tactics have to be reflective of that, and even our strategies have to be more firmly rooted in the end goal of Black Liberation, Black Freedom, a world where black folks can live within their full dignity. And that also means that everyone else can live within their full dignity. I absolutely believe that the highway shut-downs demonstrate our creativity and our desire and our commitment to not just put out rhetoric, but also to put our bodies on the line. How does today’s Black Lives Matter movement build on the civil rights movement of the 1960s? I think also that part of what this generation has done is exposed the lie that the civil rights movement resolved the issue of racism in America, or that the election of a black president resolved the issue of racism in America. To have this kind of upsurge under the nation’s first black president is a very sophisticated critique of the ways in which racism continues to work, and to also critique black mayors and black police officers who carry out these policies. That, to me, raises the level of analysis, in some ways, to a higher level than we’ve seen in past movements. CC: The movement work that is happening in this moment carries on some of the work of the civil rights movement that people rarely hear about. The work that is not elevated, the stories that were untold of everyday people, of local people, making demands. Not everyone showed up to their actions in their Sunday best. For some folks, it was their overalls. I think about people like Fannie Lou Hamer, who I wouldn’t necessarily say was on the margins of the civil rights movement, but she didn’t come out of the historically black colleges and universities or any of the sororities or fraternities like many other people did. 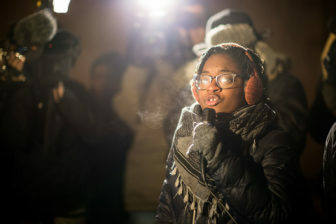 “We’re here for the families,” Charlene Carruthers, national director of Black Youth Project 100, said at a rally for police shooting victim Ronald Johnson outside a Chicago police station at 51st Street and Wentworth Avenue on December 7, 2015. Just as a lunch counter sit-in was deemed “not respectable” in that moment, we’re continuing to push beyond the boundaries of respectability in our work. It just looks different in this moment, and I think that’s OK. The last piece I would lift up is how media is used as a device in the work that we do. I don’t think we always win the dominant story or the narrative. I do think that the usage of social media is a device in this movement. Newspapers were used during the civil rights movement—we also have our own forms in this moment. BR: The black press in the ‘60s and ‘70s was a critical vehicle for communicating between local struggles and creating the basis for conceiving of a national movement. When the mainstream press didn’t cover something there were about 200 African-American newspapers, mostly weeklies, around the country. And when Ella Baker convened the gathering that led to the formation of SNCC, Student Non-Violent Coordinating Committee, she went and did newspaper clippings by hand with her little scissors to patch together all these different local struggles and to interconnect people to one another. When Martin Luther King died he was demanding not just inclusion, not just desegregation. He was also demanding economic justice. He died fighting with Memphis sanitation workers, he was in the process of planning the Poor People’s Campaign, which would bring the issue of poverty to the doorstep of the White House. And so I see in Building Black Futures, in the work that BYP 100 has done around the Fight for $15, and many of the other organizations, a recognition of this nexus that it is the marginalized, economically vulnerable members of our community that suffer the most police abuse and suffer economic violence, as well. Barbara, you’ve done so much work looking at the 1960s, what are some of the big lessons that were learned by organizers then that you think could be applied to today’s protest movements? BR: Unfortunately history doesn’t work quite like that. There are no blueprints, every historical moment is unique, and so I don’t think there are lessons that could be “lifted.” I think what I see in a good sector of this movement—not every sector of this movement because it’s an eclectic movement and they disagree with each other, as they should—but a dominant voice and strain in this movement is one that embraces an intersectional approach to understanding oppression. 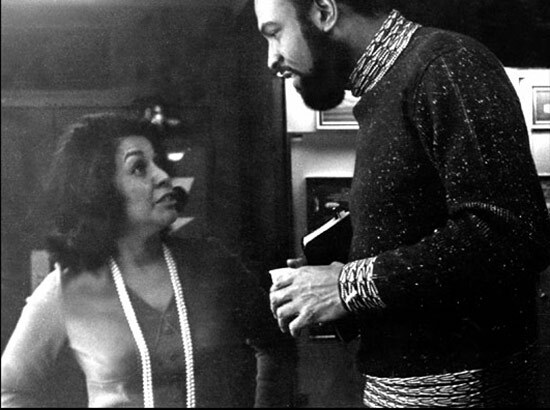 They have spoken out not only about the immediacy of police violence, but also about transphobia and homophobia and sexism and economic injustice; these issues that intersect in the lives of people and can’t be disentangled, and that’s in some ways where 1970s black feminism was and women of color feminism. That is where many of the movements were evolving to understand the interconnectedness between different systems of oppression. I see that present in the collective understanding of many of the organizers today. The internationalism of the work is very important, as well. There was an anti-colonial movement in the 1960s that was a great inspiration to young people in the Black Power movement and the civil rights movement. They traveled different parts of the world to learn from different people engaged in struggle against colonialism, and similarly there’ve been a number of delegations and people really trying in the Black Lives Matter movement to learn from the world. What are the strategies that you see being used today by activists of color that you think will leave a lasting mark on history? CC: I believe that some of the declarations around black joy as a form of resistance will leave a lasting mark. I also believe that the emphasis on healing work from the traumas that folks have experienced will leave a lasting mark. The pieces around black joy, healing and black love—they’re not completely new. But I think that those things will hopefully leave a lasting impression. BR: The level of analysis that I see and hear from many of the activists today goes really beyond racial representation. When I was growing up in Detroit we had an all-white police force. We thought, well, if we have black cops they will treat people better. That has not turned out to be exactly the case. … This generation of activists is looking at the mechanisms by which unjust systems are held together. And those systems can be held together whether we have a woman president or a black president or black police officers. For many Latinas and women under 40, feminism is associated with “bra burners,” a misnomer that has become part of the narrative of the women’s liberation movement of the ’60s and ‘70s. Coupled with the elevation of three white women — Bella Abzug, Betty Friedan and Gloria Steinem — as the standard bearers of modern feminism, it’s easy to see why many young Latinas don’t know the contributions of women of color or the history of the movement.